Recently named to Elle Décor’s Grand Masters list of top designers, this year Charlotte Moss celebrates thirty-three years in the business of design. 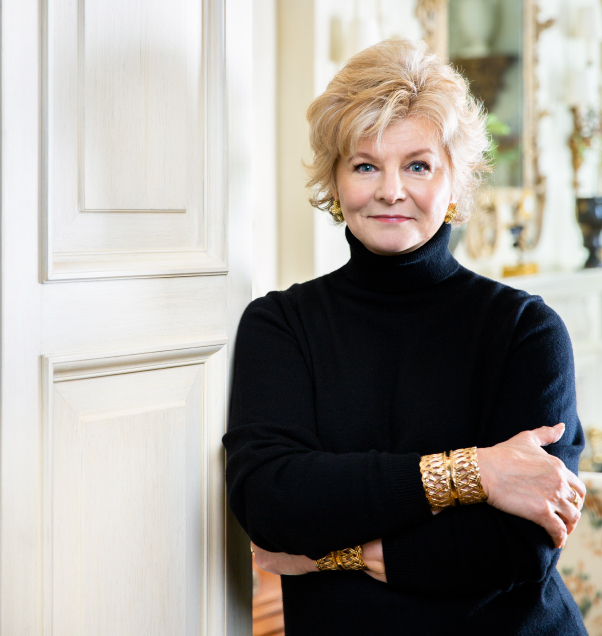 In addition to her residential interior design projects, Charlotte’s work includes designing collections of fabric and trim for Fabricut, carpets and sisals for Stark Carpet, and china for Pickard. Charlotte has used her experience culled from thirty-three years of decorating homes to design collections of furniture and upholstery with Century Furniture. This fall Charlotte will launch a jewelry collection with PE Guerin Hardware based on historical designs in their archive. Charlotte’s capsule clothing collection with IBU movement launched last year. IBU is a groundbreaking apparel and accessories brand that partners with women artisans in developing countries around the world who craft every piece by hand. Charlotte is a prolific author, having published ten books to date. CHARLOTTE MOSS ENTERTAINS is her most recent title (Rizzoli, 2018). Charlotte lectures widely and philanthropy plays an important role in her life. Charlotte is a Trustee of Thomas Jefferson Foundation at Monticello, The Bone Marrow Foundation, American Corporate Partners, The Madoo Conservancy, a member of the International Council of Hillwood Estate, Museum and Gardens, and on the Advisory Board of The New York School of Interior Design where she holds an Honorary Doctorate Degree.